Travis Scott and Tyga‘s ex-girlfriend Kylie Jenner are now a hot item. Their budding romance started over the last few weeks but it was on Coachella weekend earlier this month that the pair were first spotted together. Since then the two have been inseparable popping up together at clubs, NBA games, and yesterday they were spotted at a mall in Houston. Neither of them have confirmed a relationship, but they look very comfortable with each other. 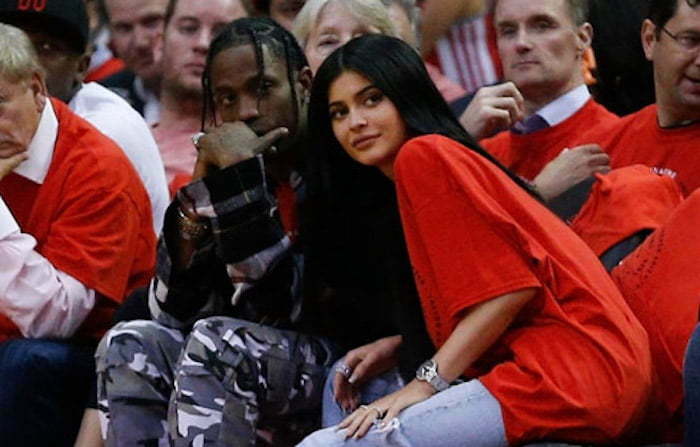 At one point while taking in the Houston Rockets playoff home game, Travis Scott rest his hand on Kylie Jenner’s thigh. They were also spotted holding each other hands while leaving Coachella last weekend and again while shopping at The Galleria in Houston. Kylie Jenner broke up with Tyga last month after dating on and off since she was 17 years old. The 19-year-old Keeping Up With The Kardashian star and Tyga have been dating since 2014, but their relationship have been rocky. They broke up briefly last year but then rekindled their relationship. It’s hard to tell if they will ever get back together this time around because Travis Scott seems to have his eyes firmly locked onto the Kylie Jenner. Travis Scott is getting read to release his third studio album and is currently in the middle of his hugely successful “Birds Eye View Tour.” Tyga has remained silent on the dating rumors but you can almost expect him to say something in one of his upcoming singles. Scott previously dated Rihanna before she dumped him and Kylie Jenner was link to PARTYNEXTDOOR last year when she and Tyga broke up. Something tells me that we will be seeing a lot more of Travis Scott and Kylie Jenner because Tyga too is rumored to be dating Jordan Ozuna although she tried to shoot down the rumors.